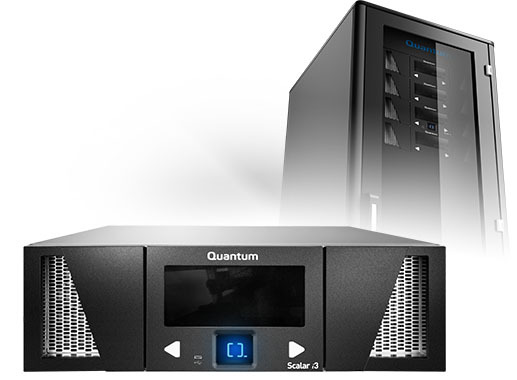 The Quantum Scalar i3 tape library is designed for ease of use, from initial setup to ongoing management. Features like iLayer proactive diagnostics, Capacity-on-Demand (CoD) scalability, 80 PLUS certified power supplies, and best-in-class storage density ensure that Scalar i3 will save money on more than just the initial purchase. You’ll see why Scalar is the market share leader in LTO automation. Scalar i3 Starting at 25 catridge slots up to 200 slots available in LTO-6, LTO-7 and LTO-8 Capacities. Quantum Scalar i3 Tape Library, 3U Control Module, 25 licensed slots, no tape drives Part# LSC33‐BSC0‐001A. Add LTO-7 or LTO-8 Tape Drives SAS or FC to this Scalar i3 Chassis. Contact BackupWorks.com for all your Quantum Scalar LTO Tape Libraries.